Illustration of President Abraham Lincoln lying in his deathbed at the Peterson House, where he was taken after being shot at Ford's Theatre the evening of April 14, 1865 and where he died early the next morning. Doctors Rufus F. Andrews and Robert K. Stone sit in chairs in front of the bed attending to the President. 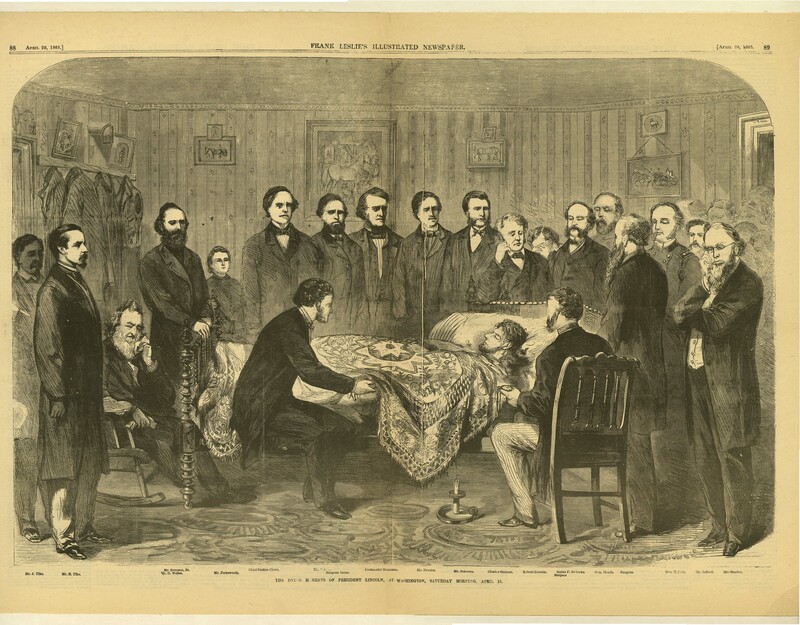 The other side of the bed is surrounded by onlookers identified (left to right) as Julius Ulke, Henry Ulke, William Petersen Jr., Secretary of the Navy Gideon Welles, Representative John F. Farnsworth, Chief Justice Salmon P. Chase, Representative Schuyler Colfax, Postmaster Wiliam Dennison, Thomas Proctor, William Petersen, Senator Charles Sumner, Robert Todd Lincoln, General George G. Meade, Dr. Charles H. Crane, General Henry W. Halleck, Henry Safford, Secretary of War Edwin Stanton, as well as unnamed others.